Earn $6.00 in Rewards credit. Click to learn more. Weighing in at a mere 28 grams yet exceptionally strong, the Ti King Cage is a great upgrade for your high-performance bike. Priced per cage. Made in the USA. I've used the stainless King cages for years and years. Finally spent up for a pair of Ti cages a couple of months ago and they are quite nice. They hold the bottles snugly, do not mark up the bottles, and are easy to get the bottles out of when it's time to drink (unlike some cages). Of course, no one really NEEDS them over the stainless version, but they are a nice piece of jewelry for any bike, especially a titanium or steel frame. THIS IS THE BEST CAGE EVER MADE BY ANYONE EVER. This is a terrible cage for containing birds, cats, dog and exotic reptiles. HOWEVER the Ti King Cage excels at holding water bottles. AND BOY does it hold them firmly. 1000 miles holding 24oz bottles and they are firm as they day I screwed them onto my frame (much unlike the cheap aluminum cages I switched from which by this time would at wizard sleeve status). I bought a pair of these years ago when they first came out. They have held up well, and have been a great value. They are well worth the price, and are about the same as when I purchased them. They will probably outlive me. The best cage there is! I have had one of these for several years. They are tuff, weigh nothing, and grip the tar out of the bottle. My gosh this cage is super light and sturdy. Holds my bottles securely. Looks so fresh as well. The best and strongest cages around. When I was building my American made bike, I wanted as many lightweight and American made parts as possible. These King cages are beautiful and at 28g, not many are lighter. Love it! WBW had them in stock and at the best price around. I previuosly ordered the same. Its still going on strong. I needed another pair for my new Lynskey Race bike. These are the light and strong Bottle cages. I wanted good, reliable cages for my new ti road bike. I already dropped over $4000 for the bike, so to spend the extra $ for these was a no brainer. They'll never brake and they match my frame perfectly. WBW had the best price, period. They were on my doorstep sooner than promised too. I will buy from them again. There are no better cages. King Ti cages are light and don't mark up your bottles. Make the investment in good cages and prevent water bottles from ever being thrown. These cages are a perfect accompaniment to any Titanium bike. They are beautifully made are of high-quality and work amazingly well. My favorite cage to date. This is the toughest cage made. It's super light, wont rust and beautiful. Someone told me the this titanium tubing is the same the use for 747 brake lines. They king cages don't have the flash of carbon fiber cages, but they are lighter and have much better holding power. I have them mounted on a behind the seat rack. Bottles launched out of the carbon fiber cages that were previously mounted. There have been no problem with the king cages! Great cages! Needed a quality cage to match them up with a titanium frame and they fit the bill perfectly. As advertised - another quality King product. One of my old ti cages actually broke apart (11 years old and used frequently) so I was in the market for another pair. Gotta keep the Seven ti looking sharp and didn't want to go back to the 'other' manufactuer for just 1 cage so saw these from King so I purchased the pair. Nice. Light, attractive cages securely hold water bottles. I am a recreational rider and use King cages on my Independent Fabrication Ti Crown Jewel road bike. The old-school design and titanium finish of the cages compliment my frame set very well. The cages are extremely light, hold bottles securely and do not scuff the bottles. The only weakness might be cost, but in my view the price of the cages was consistent with comparable products. Great product. No more markings on my bottles. Very happy. The product is 'as advertised'. Lightweight, strong, and does not mark bottles. I bought two cages for use on a Litespeed Xicon Road Bike and have been using the insulated 24oz Polar Water bottles in the cages. The cages hold the bottles in place quite well and I am fully satisifed with the purchase. 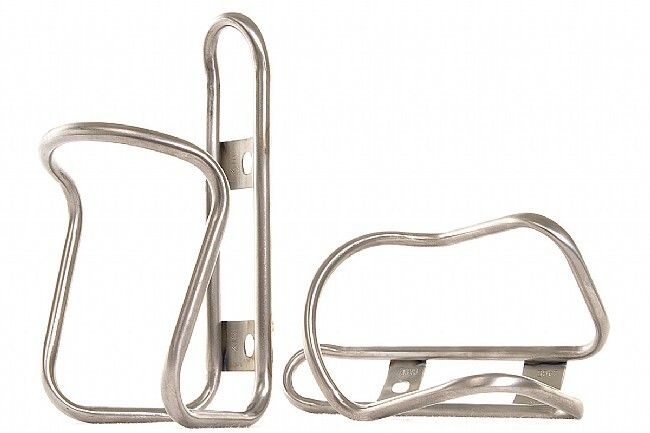 These cages are not cheap but are well made, Made in the USA, light, and look great on a Ti bicycle. While the welding is good there is a difference in the visual quality of the welds on the cages vs. the welds on the Litespeed frame. However, once mounted, the welds are not seen anyway. The ultimate bottle cage. In a world of carbon, this stands out. Also made in the U.S.A.! This cage will last forever. At 28 g., it is light as well as great looking. Mountain or road, you will never lose another bottle. The King Ti cages hold my bottles really well. They're light, and will hopefully last forever. Made in the U.S. as well. Go for it!!! Expensive, but Western had a great sale and it goes so nice with a Ti bike!